This episode did not disappoint! SongAh, though a little stupid, is completely adorable and her quirky, yet stubborn persona definitely draws you in from the get go. SongAh is playing boss as she sips her coffee, stares out the window contemplatively and then sits in the office chair. However, her bliss is interrupted as a colleague shouts at her, telling her to stop goofing around. In her work meeting, SongAh is doodling rather than paying attention. Her daydreaming about GookDae gets her in trouble and after the meeting SongAh’s friend – Oh DoekHee (Jung IRang) – warns her not to upset their boss. DoekHee knows that SongAh is having thoughts of a man and wonders who has caught her eye. DoekHee imparts more wisdom which SongAh has heard before, that when you die you rot, so you should do what you can when you are living. SongAh takes some strength in this and gets her cogs moving (slowly). While going through the FLada website, she notices a tiny ‘Event’ sign in the bottom right corner. One of the options she can choose is to use GookDae for a day. DoekHee peers over her shoulder at the screen and takes hold of the mouse and prints a copy. SongAh doesn’t look impressed, but doesn’t overly object and ultimately she ends up outside FLada. While applying lipgloss, she is shocked by the appearance of SooRi who recognises her as the customer from the other day. SooRi pushes her inside the restaurant while SongAh exclaims ‘omo’ several times. 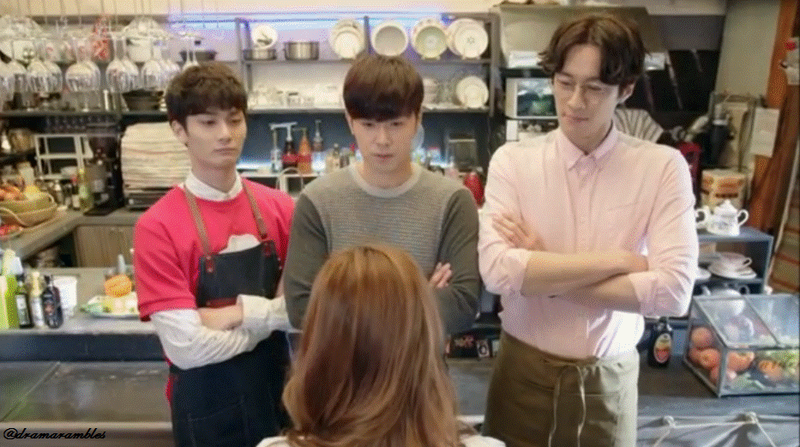 The three men stare at her menacingly (well apart from the cutie that is BiRyong~). SongAh stutters out that she isn’t here to order anything, but sheepishly holds up the piece of paper which tells them that she won the event. GookDae takes it from her completely confused. SooRi and BiRyong are shocked as SooRi recognises it as something the pair made as a joke, which they didn’t think anyone would be able to win. 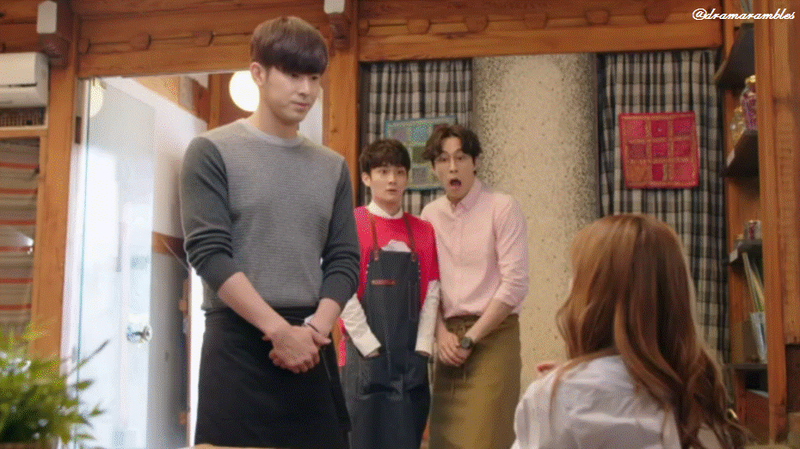 While SongAh is wondering around the shop, GookDae is chastising his staff. They tell him that they should find out what option she wants before his threats become reality. SongAh begins to choose no.2, but from the silent objections from BiRyong and SooRi, she changes it to no.4 – the use of GookDae for the day. GookDae refuses and says that those who made the mistake should be held responsible, however, SongAh confidently tells him that he did make a mistake. She brings up the ripped dress incident and GookDae loses the battle. While GookDae is silently seething, SooRi and BiRyong escape out the front door. GookDae looks a little lost at the idea, but agrees nonetheless. Once GookDae is finished and the food is set up in front of SongAh, she takes a bit and is instantly transported to the Mediterranean and her mind is full of beautiful nature. GookDae sees that she seems satisfied, which only causes her to disagree. SongAh forces him to make something else, something that would turn the worlds pain into happiness and bring people together. GookDae tightens his apron angrily and starts again. The second meal delivers just as well as the first. SongAh says to herself that it’s too much, to which GookDae hears and responds that he didn’t think she would be satisfied with just anything. SongAh exclaims that it’s lacking a lot and tells him to make something that has an explosive taste. GookDae, rather annoyed at this point says that she wouldn’t be able to handle it. She takes that as he has given up. While forcefully calm he dissents, saying that he will see it to the end. Once again he tightens his apron and begins to cook. Once the food has been served, GookDae proposes that they make the final decision with this meal. SongAh agrees. She takes a bite and GookDae begins his countdown from 5. Once at zero rockets explode in her mind and SongAh screams (did he make the food super super spicy?). A smug GookDae commends her for trying and tells a very dazed SongAh that she should go home now. SongAh snaps out of her dazed state, when GookDae leaves to answer his phone, to stuff her face with all the food before her. Outside GookDae talks to BiRyong, saying that SongAh used him well and even has his soul. BiRyong thinks this is strange behaviour for him, but GookDae didn’t want to just cook something acceptable and then send her away. 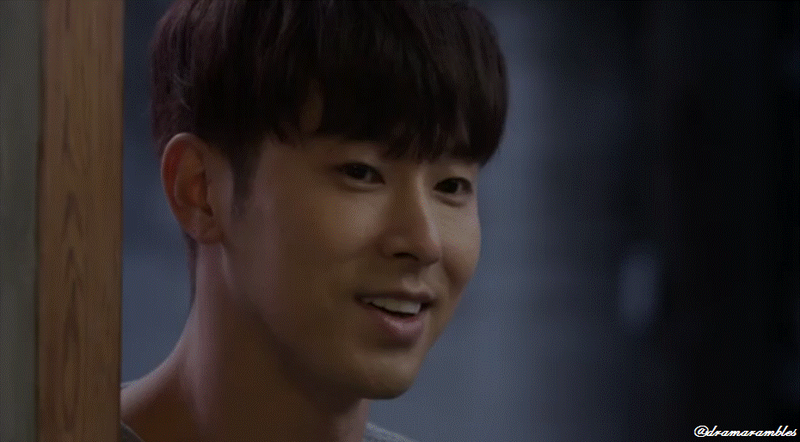 He then hears SongAh’s happy exclamations and stands in the doorway smiling at her (this is so cute :3 Why does my heart feel so fluttery when YunHo smiles at her adorableness?). This giddy inducing scene is ended when SongAh starts choking on a meatball and GookDae runs over to perform the Heimlich manoeuvre on her. GookDae stares in horror as he watches the meatball fly across the room, causing an ornamented plate to fall. He throws SongAh to the side and collapses to his knees where the plate is now in pieces (his ‘aigoos’ were so cute~). 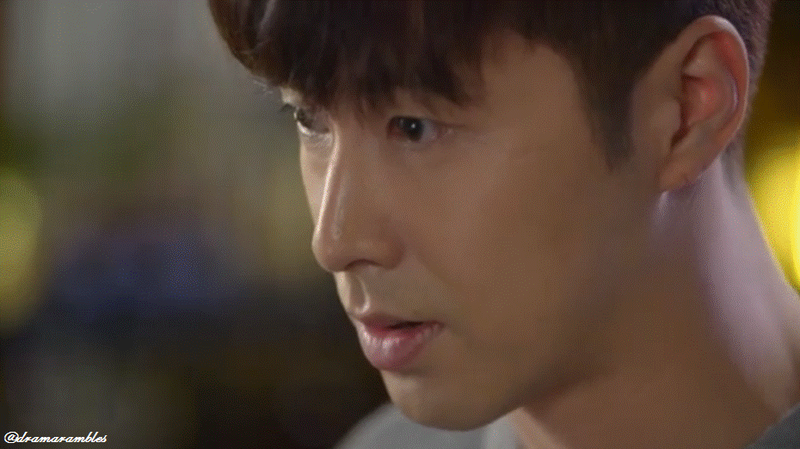 SongAh hurries over and apologises and then offers to compensate him with money. She checks her purse and then sheepishly asks if he will accept credit card (haha). GookDae angrily tells her that the person who made the plate has died and so another cannot be found anywhere else in the world. He even tells her to go to the other world and get another one, to which she tells him that’s a bit too much (Ha!). 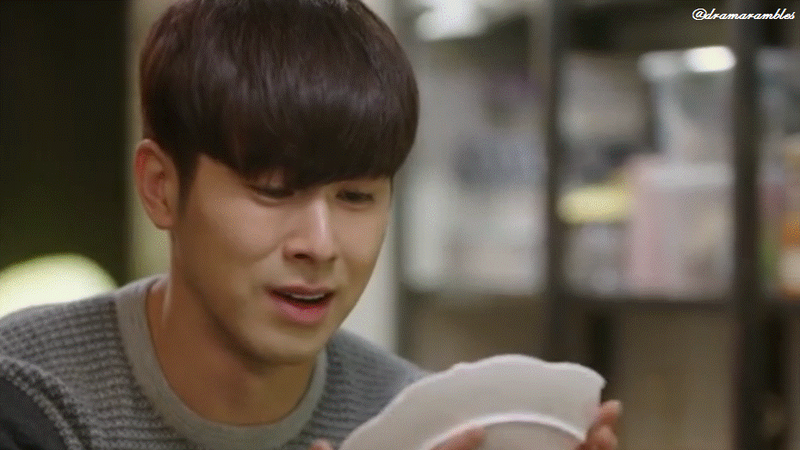 While GookDae cries over the plate and says that it is over a hundred years old, SongAh begins to tell him that if the plate has lived that long it’s time to let it go, but changes tactic halfway through, asking whether they should reconstruct it with glue. She takes the piece he is holding and further breaks the piece into two. He tells her to compensate the damage by working in the shop (is this Ouran High School Host Club? Oooh FLada Host Club… haha ^^”). SongAh is met with a contract for 100 voluntary hours (his reasoning is that the plate was around 100 years old) which she strongly objects to, calling him crazy. He then tells to her to do paid work then. Even so she still objects about the hours and deems it a slave contract. She refuses and obstinately tells him to sell her organs instead (what?!). GookDae then starts to stroke her arm, hold her hand andthen presses her thumb to her lips. SongAh is so completely happy at this that she doesn’t realise what’s happening until after he presses her thumb onto the contract to seal the deal with her lipgloss print. GookDae tells SongAh to call him boss and that they will see each other a lot, meanwhile SongAh is speechless. 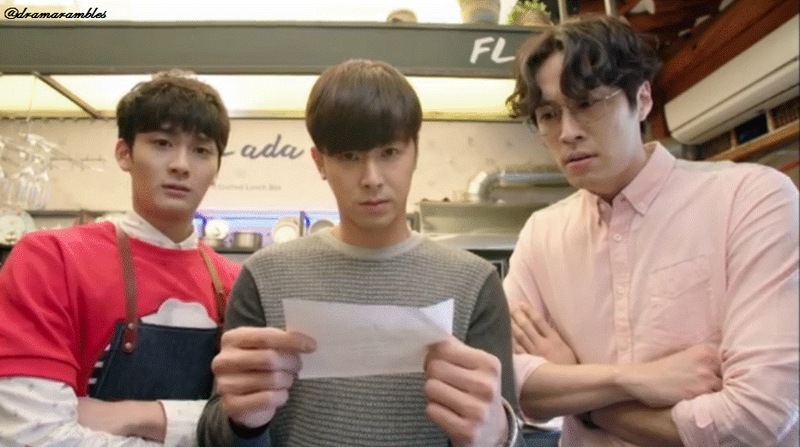 I love the little skits after the preview, it really adds more to the drama, especially as they generally show more insight into GookDae and what he is really like, rather than just seeing him using the ‘I like you, so I’m going to be mean to you’ tactic. Also, we see that the plate was already broken in the first place! The story progression is moving on nicely, it’s fast paced, but it everything makes sense and because the episodes are longer than any webdrama’s I have seen so far, that is helping it a lot. The acting on Ga Eun’s part is astonishing, I love the way she acts and I definitely want to check out what she has been in and/or look forward to her future projects. 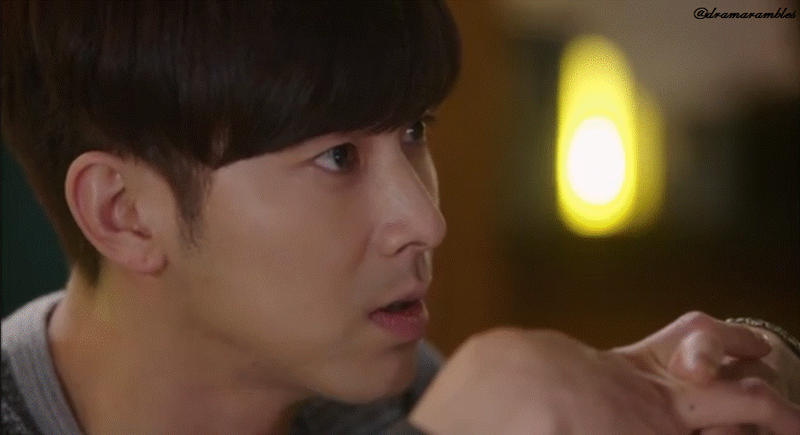 I also haven’t seen anything that YunHo has been in before (I don’t even know if he has or not), but he is pleasantly surprising me with his ability. Sometimes it seems a little forced, but it doesn’t ruin the enjoyability factor of the drama and I think he is doing a good job so far. I’ve just been watching I Order You, and I love Song Ah’s character. She is adorable, and the drama has been really cute so far 🙂 Nice recap.